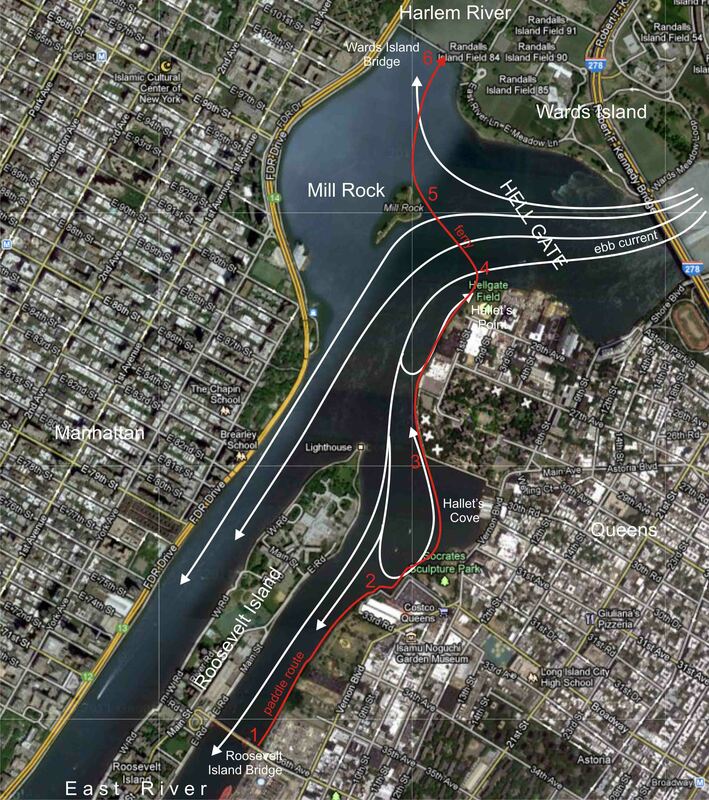 If there’s a chance that the ebb will begin before we reach Hell Gate, we paddle up the Queens-side (East) channel, rather than the Manhattan-side (West) channel, past Roosevelt Island. In the Queens-side channel, the currents are slightly weaker, and, more importantly, there’s much more opportunity to hide from the contrary ebb current. As we reach the southern end of Hallet’s Cove (“2”), we find ourselves accelerating forward. This is because the ebb current creates a helpful back-eddy, which conveniently strengthens as the ebb current itself strengthens, that carries us rapidly across the cove to the southern seawall of Hallet’s Point (“3”). Again, we skirt the edge of the seawall, accelerated forward by another back-eddy, until we reach Hallet’s Point itself (“4”). Here we find ourselves in calm water just feet away from the main current stream, by this time often rushing past at several knots. Directly across the stream is Mill Rock, our immediate destination. We scan in both directions for boat traffic and plunge in. The stream begins to carry us south but we ferry across, angling into the current, sometimes even surfing sideways on the standing waves that it generates, to arrive at Mill Rock in no time at all (“5”). Once upon a time, I used to worry about missing the current in Hell Gate. Now I actually look forward to it! This entry was posted in Kayaking, New York City and tagged Hell Gate, Kayaking, New York City, New York Harbor, Tidal Current. Bookmark the permalink. Still, IMHO, it is better to get to Hell Gate before the current turns. So yes, this little dodge has come in very useful on occasion! I don’t kayak (or even sail) but i do collect facts about NYC My F-I-L (RIP) was a engineer in Coast Guard–and he once mentioned–the currents in Hell Gate can run 30 knots! (in the center of the current)–and many a large ship has found themselves caught–and going no where! But 30 knots, no. Five knots is about the typical maximum, and that at peak strength, during spring tides, in the middle of the channel. That would make some interesting kayaking! But if Hell Gate were like this (never mind 30 knots), given the tortuosity of the channel it would prohibit all barge traffic, and most other traffic, except at very limited times around slack. As it is, barges, which can’t move very fast safely, can have a hard time going through Hell Gate even if it is running at only a few knots. I’ve seen mid 5’s. Never anything in excess. Still — 5.6 is intense! Yes, although 5 knots is a “typical” maximum, you can definitely get more. I certainly remember once or twice moving along at 11 knots, according to my GPS, and since I don’t paddle faster than about 4 knots… you do the math! I love seeing New York from your perspectives – a totally different world! No wonder Tugster calls the harbor “the sixth boro”! When not doing a circumnavigation it’s also good to be there at max ebb during a spring tide. Love the standing waves! Yes, I believe the preferred spot for surfing the standing waves is under the Queensboro Bridge in the Manhattan-side channel, isn’t it? There is a very nice standing wave that lasts about 45 minutes or so under the QBB.in the West Channel. Tug captains get quite annoyed if you play in it but it’s fun i you can time it between commercial traffic. Bigger ones yes, but smaller warm up ones near the Mayor’s house as the ebb builds. Great discussion, images, maps. 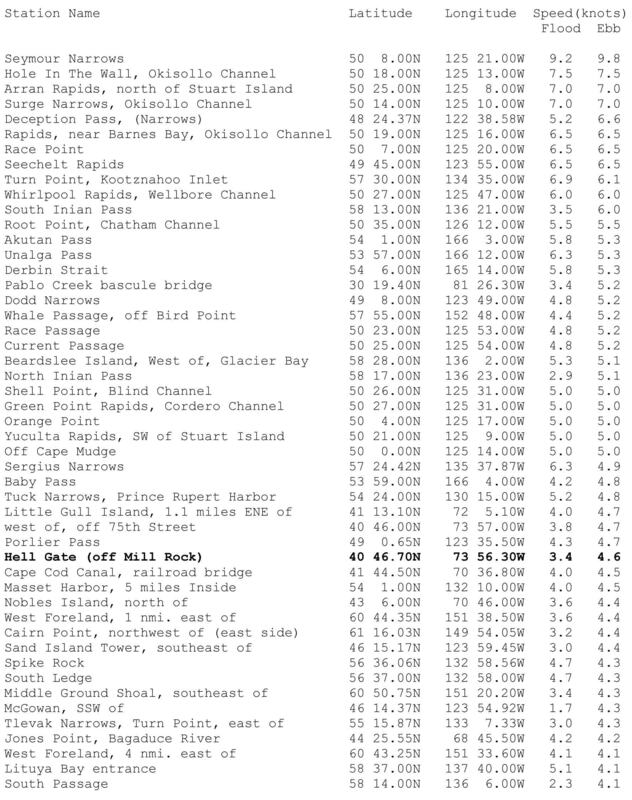 Terrific to know that Hells Gate has the 34th strongest tidal current in N. America! I am only an infrequent kayaker but I do enjoy keeping an eye on the Hudson, visible from the roof of my building and my bike ride to/from work. Good to be aware of all the currents around us. Thanks, Ben! 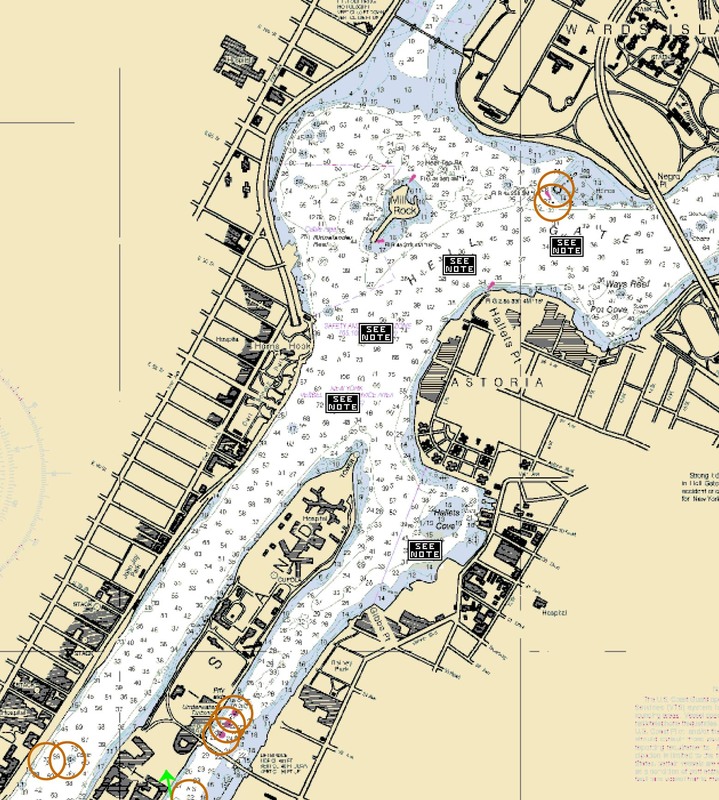 Yes, the Hudson’s currents are pretty significant too… it’s hard to do much kayaking around New York Harbor without figuring out how to use, or at least come to terms with, its currents! Hi. We are new to kayaking in NYC. Thank you for all the info! You are welcome! Plenty more info to come! Where are you going to paddle in NYC? BTW, I saw your photo album from your Everglades sailing trip. Great photos! I wish I had your courage and skil! How did I miss this post? While I have no intentions of ever needing the info here, I absolutely love reading your navigational calculations, based on experience. You two are amazing, but you make it all sound so … reasonable. Is a spray skirt necessary? I have a liquid logic remix xp10 kayak. Would it be wose to use my spray skirt for this trip? Hi Joe, the answer is a bit more complex than I can provide here. I’m sending you an email with the response.